Do not touch the hot nozzle. Keep 5-6cm distance between the heat gun and target items. Do not recommend continually use more than 10 minutes to prevent nozzle overheat. Please read the operating instructions before use.Thanks. Your Satisfactions are very important to us, Please don't hesitate to contact us if you have any questions. We'll try our best to assist you within 48 hours. Thanks! Hot air shrink gun was made of high quality stainless steel inside and ABS plastic outside. 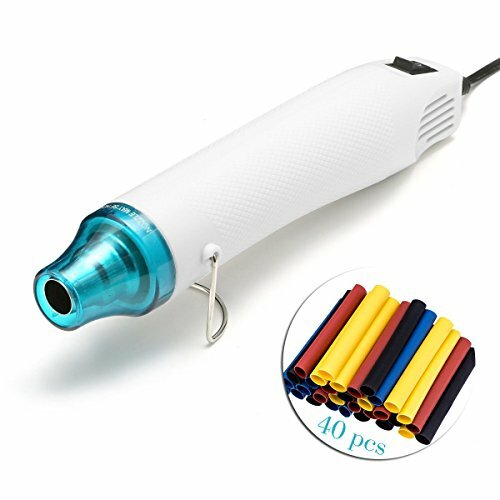 Use the excellent heat gun for heat shrink tubing, embossing, shrink wrapping packages, melting and bending plastics and laminates, and softening floor tiles. At heat gun tail, the heat vents designed in both sides to reduce the internal temperature and extend the product duration. Two pin US plug and 1m / 3ft cable, The temp of the nozzle could reach to 200°in seconds. If you like DIY, this is a good accessory for you. Even ,you can replace toaster or oven and the polymer clay will become hard and bright after using the gun. Glue sticks are assorted in color. If you have any questions about this product by GreatRich, contact us by completing and submitting the form below. If you are looking for a specif part number, please include it with your message.